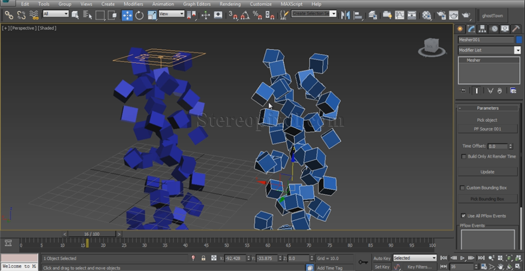 Mesher is a compound object with a very specific use in 3Ds Max. This compound object is a very handy tool for the visual effects artists. Mesher helps us to convert the particle objects into mesh object or geometry. So lets see. First create a basic PFsource in the scene. Convert the display type to geometry to view the geometry types like cube or diamond etc. These particles cannot be convert into geometry by simply putting "edit poly" modifier as you will never found them in the list by selecting the particles. To convert them into geometry you need the compound object called "Mesher". From compound object select mesher and create the mesher object in viewport. Then go to the modify panel and from there select the "pick object" option and select the particle object. Immediately the particle object will replicate and create the identical objects. Now still these are not a mesh or poly object, but if you go to modifier list you can use edit poly or edit mesh modifier to convert them into poly or mesh. Follow the video for more details.